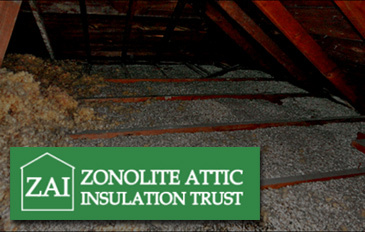 The ZAI Trust was created for the benefit of homeowners with the ZONOLITE brand of vermiculite attic insulation. Specifically, Trust funds are used to reimburse homeowners a portion of their cost to remove or contain Zonolite attic insulation. See FAQ's. Assuming a claimant meets the PID and Expense Requirement he/she may receive a reimbursement contribution of up to 55% of the abatement costs with a maximum reimbursement amount of $4,125.00*. For example, if a claimant spent $7,500 removing and replacing the insulation, he/she is potentially eligible for the maximum reimbursement of $4,125*. If he/she spent $3,000 for abatement and re-insulation, the potential reimbursement is $1,650 (55% of $3,000). Note: Claimants are strongly encouraged to submit ALL documented allowable expenses for vermiculite removal AND reinsulation, even if those costs exceed the maximum allowed claim value of $7500*. PLEASE VISIT OUR FAQS FOR MORE IMPORTANT INFORMATION. Zonolite Insulation is the trademarked name of a product mined in Libby, MT, and sold as attic insulation between the 1940's and mid-1980's. Consisting of the naturally occurring mineral vermiculite, Zonolite was used for decades to insulate millions of American homes. This attic insulation was typically gray-brown or silver-gold in color, consisting of a pebble-like texture. Part of its popularity within the construction industry stemmed from the fact it was lightweight and fire-resistant. Unfortunately, “Libby vermiculite” or Zonolite is known to have contained a small amount of hazardous asbestos. Although not all vermiculite is the Zonolite brand or contains asbestos, the EPA advises that you should assume that vermiculite contains asbestos. Zonolite attic insulation, or “ZAI,” may prove harmful to residents because it remains in many attics and homes across the United States and because it is considered “friable", i.e, easily disturbed and distributed into the air. Pursuant to a legal settlement, W.R. Grace, which operated the Zonolite company from 1963-1990, has funded an independent Trust and claims facility from which eligible claimants may receive partial reimbursement of their cost to remove or contain ZAI in their homes. The Trust will operate for a minimum of 20 years educating the public about the existence of the Trust and the potential health effects associated with asbestos-containing Vermiculite/ZAI. Removing Zonolite as a do-it-yourself project should not be attempted because of the friable asbestos. Additional important information regarding the Trust and asbestos-containing vermiculite.